On first entering VegasBerry you will be met with a very simplistic website. However this simplistic design is elegant with its colourful games set into the dark background of Black and Gray. The website itself is easy to navigate which is great for playing on mobile and tablet devices. VegasBerry has an incredible selection of games from the top game designers and enticing bonuses. This makes VegasBerry a very alluring website for new players and seasoned alike. VegasBerry has a immense selection of different bonuses ranging from an initial welcome bonus package to deposit bonuses, cash back and free spins. VegasBerry also offer a loyalty scheme. All these promotional offers are subject to changesbased on what day of the week it is and which region you are playing from. So why not follow the link above and check out which of these fantastic offers you can claim today. VegasBerry has a tremendous selection of enjoyable games to keep you entertained and coming back for more. The 700+ games on offer are made up of video slots, live casino games, poker and other table games. All from some of the biggest game designers in the online casino business. This leaves you with a lot of choices and gives you the perfect opportunity to find the right game for you. This easy accessibility is amplified by the help of a search function to aid you in finding your favourite game even faster. The payment options offered by VegasBerry appear to be very standard with all the usual choices of credit cards, e wallets and prepaid cards all being accepted. The websites support sections covers a range of different problems you might encounter whilst making a new account or deposits. If none of these solutions work for you they offer a 24/7 live which offers quick response times. Alternatively you can use email or a contact page which may take longer to resolve your issue. To sum up VegasBerry I would have to say that the website is very uncomplicated. This is not a bad thing as if gives the VegasBerry a very graceful appearance. That isn’t cluttered with useless information or ads and is easy to operate. This is especially useful when playing on a mobile or tablet devise. The load times of the games are fantastic and there is a wide variant of games from all the leading casino game designers like Betsoft, Microgaming, NetEnt and 1x2gaming. All this combined makes VegasBerry a very welcoming and enjoyable place for new players to take their first steps into the world of online casinos. 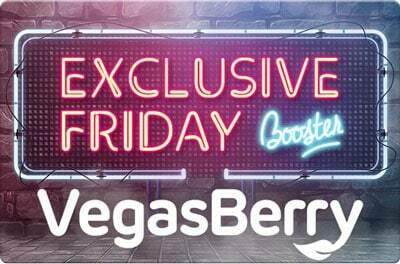 So whether you are new player or a veteran why not follow the link above and claim one of the generous bonuses offered by VegasBerry.